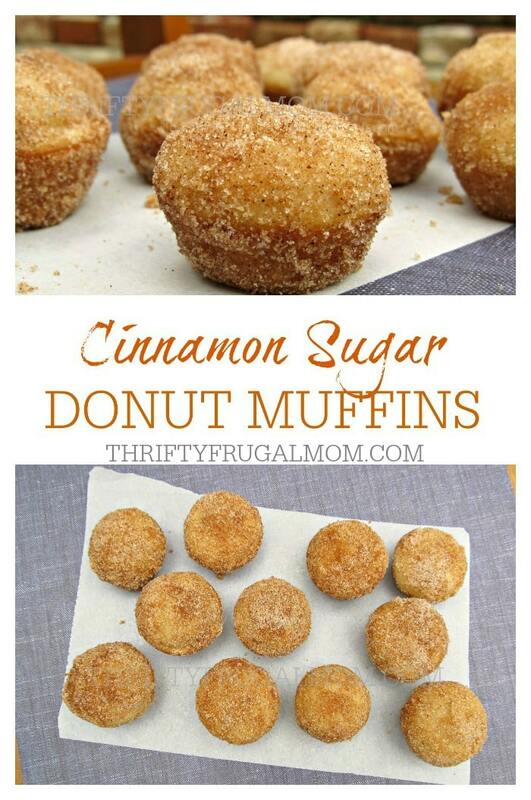 Full of flavor and rolled in cinnamon sugar topping, these little donut muffins are perfect to munch on any time! They’re healthier than a donut, but just as delicious! These little muffins are quick and easy to make and and super flavorful with their nutmeg and cinnamon pairing. While they remind me a lot of a cinnamon sugar donut, I also think they taste an awful lot like a Snickerdoodle cookie! And I love that they are baked instead of fried. No greasy, oily mess to deal with and less calories make that a plus all around! These little bites of deliciousness are perfect for brunches, snacks, breakfast and even dessert. 2. Stir in the milk then mix in the flour, baking powder and nutmeg just until combined. 3. Grease 24 mini-muffin cups. (I have this mini muffin pan and love it!) Fill cups half full of batter. 4. Bake at 375 degrees for 10 to 12 minutes or until toothpick inserted in center comes out clean. 5. While muffins are baking, get the topping ready. Place 1/4 c. of melted butter in a bowl. In a separate bowl combine 1/2 cup sugar and 1 tsp cinnamon. 6. Once baked, dip each muffin in the melted butter then roll in the cinnamon/sugar mixture. Let cool before storing. Oh, these look so good! Snickerdoodles are my favorite cookies so I will definitely have to try these out. I'm sure you won't be disappointed Michaela! And enjoyed reading about your Africa trip. May God bless you as you go....I'm sure it will be life changing! Those look so good! Usually I hear of people frying donuts...does it make much of a difference to bake them in the way that they turn out? Thank you for linking up to Frugal Friday. Sarah- These little gems are more of a muffin with the flavor or a donut if that makes sense. They don't have that deep fat fried taste, but taste maybe more like a cake donut. I love them because they are delicious and I can eat them with less guilt than an actual donut. Perfect! and I have all the ingredients on hand. Will have to try these for the teens this weekend. Thanks so much for this recipe! These are fantastic! My three toddlers ate them as fast as I could make them, I had to make two batches! Thanks for a great recipe with simple ingredients. This is definitely a keeper I will make for many years to come! Thank You ? So glad that you all loved them- especially the toddlers! :) Always nice when you can find a recipe that keeps the little ones happy, right? Love these!! Did a little variation and used some powdered sugar on a few as my little one loves those powdered sugar donuts from the grocery stores... She's in love! We make these all the time now! I make batches freeze then sugar them up later! Amazing!!! Thank you so much for the recipe! Oh, I like how you were creative and did the powdered sugar variation. Smart mama! ;) And I love the idea of freezing them. Not sure why I never tried that myself! Thanks for taking the time to let me know you love these- comments like this always make my day. :) Happy donut muffin eating!